Deadline for applications through competent official authorities: 5 April 2019! Organizers: The International Atomic Energy Agency (IAEA) Ocean Acidification International Coordination Centre (OA-ICC) and the Scientific Committee on Oceanic Research (SCOR) Working Group 149. The objectives of this training course are to become familiar with the modes of learning available in the new SCOR WG149 web-based best practice guide (to become available in April 2019). 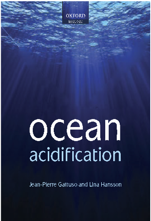 This best practice guide will provide a valuable platform to test methods and best practices for ocean acidification studies within a multi-stressor context that were developed at an IAEA Technical Meeting held in Monaco in June 2017. – New science collaborations among scientists attending the event. The ocean is subject to a multitude of human-caused pressures, such as ocean warming, acidification, eutrophication and oxygen depletion, acting simultaneously in complex ways. A major challenge for scientists today is to determine the cumulative effects of such interactive stressors on marine organisms, communities and ecosystems. Most studies on ocean change to date have investigated the response of acclimated single species/strains under the influence of a single driver. However, the assessment of impacts on ecosystems, necessary to inform science-based policy advice, requires information on responses to multiple drivers at the ecosystem level. There is an urgent need to develop a new generation of studies based on methodology that will allow studies to progress from single to multiple drivers, from organisms to ecosystems, and from acclimation to adaptation responses. The trans-disciplinary Working Group 149 of the Scientific Committee on Oceanic Research (SCOR) is working to design a framework of experiments, observations, and conceptual/mathematical models to address this need. These include a series of guidelines to perform multi-stressor studies, including a web-based decision support tool for researchers to assist with the design of their experiments; a virtual marine scientist laboratory application called MEDDLE (Multiple Environmental Driver Design Lab for Experiments) to test experimental set-ups; and a series of video tutorials on a range of topics made by experts in each field. These resources will go live in April 2019 and will provide a platform for the next generation of scientists to conduct rigorous interrelated research and to further refine this approach as new technologies emerge. 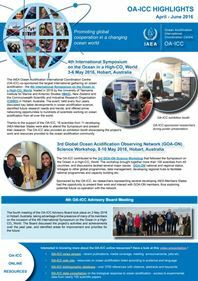 The IAEA Ocean Acidification International Coordination Centre (OA-ICC) promotes international collaboration and coordination to address ocean acidification. Among its many activities, the OA-ICC facilitates the development of standardized protocols, methods and tools for ocean acidification research to ensure the quality and comparability of results. To that end, it also promotes the use and development of guidelines and protocols, including those developed by SCOR Working Group 149, for both newcomers and established scientists working in the field, as well as training using these tools. This training will be based on the web-based decision support tool and other tools developed by the SCOR Working Group 149, and include both lectures and discussions in plenary sessions and hands-on laboratory sessions in smaller groups to support the online tools. Subjects to be covered include: introduction to multiple-driver studies and to a newly developed online best practices guide for multi-stressor experiments, including a decision support tool, and the MEDDLE (Multiple Environmental Driver Design Lab for Experiments) simulator. in the ocean acidification/ocean change field. All persons wishing to participate in the event have to be designated by an IAEA Member State or should be members of organizations that have been invited to attend. In order to be designated by an IAEA Member State, participants are requested to send the Participation Form (Form A) to their competent national authority (e.g. Ministry of Foreign Affairs, Permanent Mission to the IAEA or National Atomic Energy Authority) for onward transmission to the IAEA by 5 April 2019. Selected participants will be informed in due course on the procedures to be followed with regard to administrative and financial matters. has to be stamped, signed and submitted by the competent national authority to the IAEA together with the Participation Form (Form A) by 5 April 2019.